Ah, the joy of breaking childhood games. 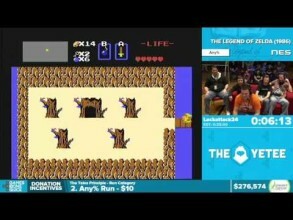 SpeedDemosArchive’s charity speedrn marathon, Awesome Games Done Quick 2016, is well under way, and two days ago, Lackattack24 had a great run of The Legend of Zelda on NES. As with any other run, Lack and the gentlemen on the couch help to explain what is going on, how certain aspects of the game work, and what is done to glitch the game. It is an entertaining run, clocking in at 30 minutes and 14 seconds. Check out the full run after the jump! For the record, there is a hard lock about seven minutes as the game froze, so Lack restarts the run. The restart to the complete run is at 8:38. Right off the bat, anyone not accustom to watching speedruns will likely be thrown off by the things like screen scrolling. I suppose most people playing this game as a child never imagined the game would be broken to the point of jumping past trees, stones, and all other obstacles by way of in-game math errors. Honestly, as much as the use of major glitches fascinates me, what I appreciate most about this kind of run is what the boys on-screen mentioned – this game essentially has different occurrences for every run. Between the rupee drops, bomb drops, damage taken and enemy patterns, there is just too much RNG (random number generation) for speedruns to be consistent, and that makes for a great watch, as not even the runner can tell what will happen. Make sure to check out the stream, going on for the rest of this week! And check out LackAttack’s stream page! Did you enjoy the run? Are you currently keeping track of the marathon? Drop a comment!